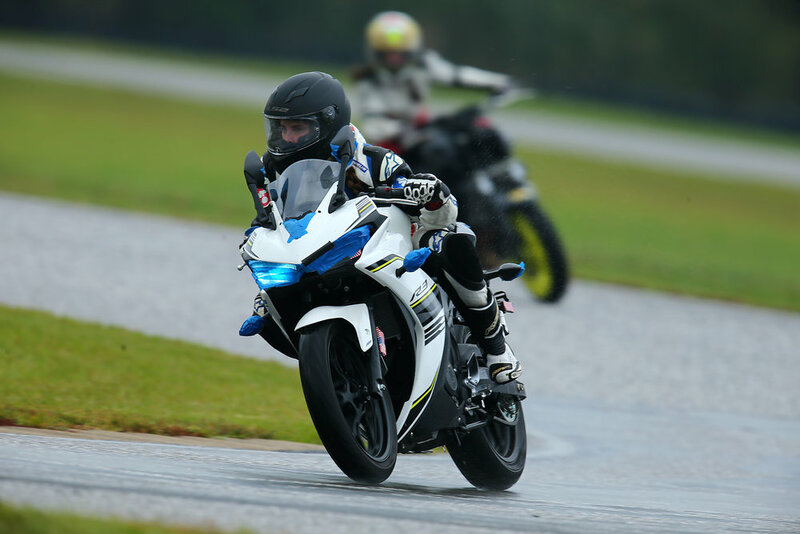 The day had finally arrived, my bags were packed, and I was headed to Birmingham, Alabama with Michelin Motorcycle for an all girls Track Day at Talladega Gran Prix Raceway, put on by Sport Bike Track Time. I hadn’t thought a whole lot about what to expect, because I honestly had no idea what the day would involve. I had attended a Moto GP race earlier in the year, and that was about the extent of my track and racing knowledge. One recurring thought I had was how nervous I get in turns. I’ve been riding Harley’s for about 8 years and am confident in my skills… but if I lack in one area, it’s taking tight turns at high speeds. I’m a very cautious person, I like to feel like i’m in control, and don’t really love to venture out of my comfort zone. People always laugh when I tell them that because “hello, you ride motorcycles!”, but I would argue that I can still be cautious and ride a motorcycle. When Randy from Michelin said I would be attending this track day with Jolene, an “off-road athlete”, I didn’t think about it again until I met Jolene in the car pickup at the airport. I quickly realized “off-road athlete” was the understatement of the century. It was Jolene Van Vugt, who had spent 12 years in Nitro Circus doing stunts, and who was the first woman to backflip a full-sized dirt bike, ramp to ramp. Not to mention she did Catwoman’s stunts in the film The Dark Knight Rises. Needless to say, I was now a little worried about the track day. We went straight from the airport to the track to get our leathers and to make sure we were ready for the following day. I think Jolene could probably see my hesitancy and reassured me there was nothing to be worried about and that we would be eased into it. That night at dinner I asked Jolene about a million questions. She was easy-going and told me a little bit about what being in Nitro Circus was like, what kind of riding she likes to do, and of course about the stunts she performs in movies. We became fast friends, and I was excited to see what was in store for us the next day. Sportbike Track Time holds several track day events throughout the year, but, why I personally think they’re so rad is because they hold several all-girl track days. It can be very intimidating to get on the track for the first time, and knowing it was only going to be women there that day made me feel much more comfortable. Sportbike Track Time is also Michelin’s premier race tire distributor that supports a network of tire vendors who provide tech support to racers and track day riders across the country. Basically, they know what they’re doing and I knew i’d be in good hands for the day. We started the day with a rider meeting and split into two groups, Novice-Intermediate, and advanced. Pretty much everyone was Novice-Intermediate, unless you had been to multiple track days and felt very comfortable. From there, we split into smaller groups of about 6, and each group had a lead. The lead was an experienced track rider, and would be the one leading us once we got on the track. The day was made up of seven track sessions of 20 minutes, with three training sessions before the first three track sessions. The first training session we went over all the basics; how to get on and off the track, how to pass another rider safely, the layout of the track, hand signals, etc. Then, it was time to get on the track for the first time. There were six riders, and for this session we would be following our lead the entire 20 minutes. The goal was to get comfortable, keep the pace, and see where our lead entered and exited each turn. I hopped on my Yamaha R3, which was my FIRST time on a sport bike, and slowly made my way to the track entrance. Our group got the green light and we were off. I decided to stay in the very back of the group so I didn’t have to have anyone riding behind me. I wanted to ease into it and not feel panicked like I was slowing someone down. When the first session came to an end I was kind of relieved and really hoped I would get more comfortable as the day progressed. Feeling really self conscious I went to the second training session. Turns out a lot of other women were feeling the same way I was and had just as many questions. 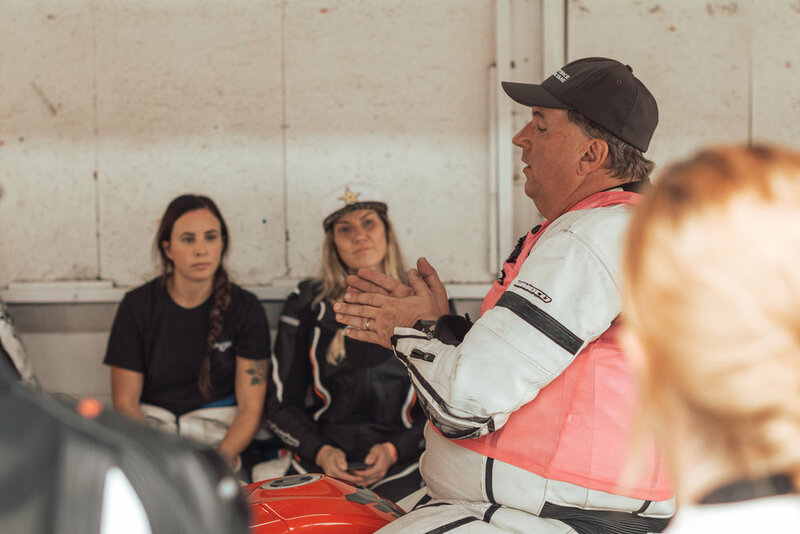 We talked about where to enter and exit a turn, when to throttle, when to brake, and dove deeper into how to ride on a track. Feeling a bit more confident after the training session, it was time to hit the track. Again, I was sure to stay in the back of the group. About 10 minutes into our session I started feeling more in control. I could anticipate the turns, throttle, and brake in the correct places, and felt like I started to figure it out… kind of. Plus, I was starting to have fun. This was our last training session and it was all about body position. The instructor had us all sit around a bike and explained where your body should be before a turn, in a turn, and after a turn. Where your weight should be distributed and how to make the bike work for you. I had a chance to sit on the bike and be critiqued by the instructors. The next riding session we were doing something called “point to pass”, meaning the instructor would ride behind one person and watch how they were doing through turns, and point them ahead if he thought they were ready to venture off on their own. In this riding session I was finally starting to feel confident. Implementing the things I had learned made it so much easier and I was starting to go faster. Ok so remember how I mentioned i’m a control freak and cautious? Just when I started to feel confident on the track, it started to rain. I’m not talking a light sprinkle, it was RAINING, and if there’s one thing that shatters my confidence on the road, it’s rain. Rain AND sharp turns? That’s a no for me. I franticly went around asking the instructors if we were going to postpone our session, or if they would have to cancel the track day. To my dismay, no such thing was going to happen. I remembered learning all about a dry vs. wet track conditions and what tires are used for both at Moto GP. My bike had the MICHELIN Power RS tires on it, which are known for exceptional grip in wet conditions, but I was still apprehensive. After I realized everyone was still going to ride in the fourth session, I decided to buck up and do it. This was one of those situations where you just have to grit your teeth and send it. I KNEW my tires would still have grip on the track, and that I wasn’t going to just slide out on a corner, but it definitely went against all of my instincts. We lined up to enter the track, and just before the light turned green, our lead said “be careful it’s slick out there!”. I may or may not have had a total freak out in my helmet, but I wanted to prove to myself that I could do this! After a very slow first two laps, I started to gain speed, and almost forgot it was even raining. Don’t get me wrong, I still didn’t lean as hard or go as fast as I would have if it weren’t raining, but I was leaning into the turns and practicing my technique. I felt good! When the session was over and I took off my helmet I felt like I could scream I was so excited! Luckily the rain cleared up and the track dried for the final three sessions of the day. I was able to get coaching between sessions and progressively get better each time. By the last couple of sessions I was passing rider after rider and having so much fun. I’m only kind of kidding when I say I was ready to buy a sport bike and get into racing. Riding on a track was like nothing I have ever experienced and if I ever get the opportunity again, I will be the first in line.